POLITICAL TIDBITS: Manny Pacquiao, give your adoring fans a break: don’t run for the Senate. Stay in the ring where you’re the greatest---the champ. Manny Pacquiao, give your adoring fans a break: don’t run for the Senate. Stay in the ring where you’re the greatest---the champ. 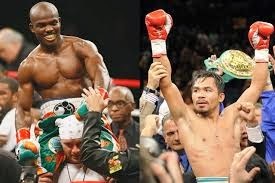 Manny Pacquiao regained his welterweight champion title earlier today after his celebrated bout with Timothy Bradley in Las Vegas, where he demolished the American boxer. Filipinos all around the world rejoice in his victory---even as we were all frightfully nervous at first whether our champ, defeated by Bradley in a controversial decision nearly two years ago, could truly rout the black American boxer, or whether Bradley could truly usher Pacman to retirement, as he had bragged earlier. It turned out that the Kano boxer was no match for Manny’s inexhaustible energies and lightning speed, which twice nearly sent his opponent to the floor. So, okay, Manny Pacquiao won decisively and sports analysts speak about his raring to go on to other fights in the next few years, as they note that the revitalized boxer shows that he indubitably still has the fire of a champ in his belly and his fists. Fine---so go on with those bouts that will become the stuff of legend. What bothers me and doubtless many other observers, however, is that even before his fight this morning began, Pacquiao was already talking about being “80% sure that I would run for the Senate” in the next elections. Can’t the champ just stay in the ring and win other bouts, other titles? Why does he have to run for the Senate that’s already filled with misfits---those who don’t have an iota of what legislating is all about. In the House Rep. Pacquiao was rarely seen and even more rarely heard. I recall when he arrived in the House session hall straight from the airport during the critical voting on the RH bill a year and a half ago. It was just after his disastrous defeat by boxer Juan Manuel Marquez who knocked him out cold for two minutes. The Pinoy champ was meek and humble as a lamb as the cavernous Batasan rang out with a standing ovation and lusty cheers. But now he admits to training his sights on the Senate, presumably without giving up the boxing titles to still conquer. That’s having his cake and eating it too. To stay on top of the boxing world, however, even as he remains as senator, he'd have to be out more often for training abroad. That's not fair to his constituents. No, Manny, give your adoring people a break: just stay in the ring where you’re the GREATEST, THE INCOMPARABLE CHAMP. Be the LEGEND you deserve to be, IN THE RING! Take on Marquez again, and yes, that dream bout with Floyd Mayweather. But stay in the ring and away from the Senate. That way you’ll teach a valuable lesson to all those delusional misfits who think being senator is just a walk in the park---as they undeservedly thrive on a name that rings a bell with the masses, or worse, buy their way through elections and recover gargantuan expenses through some fake NGOs. We need real legislators, who'll put their brains and heart together for the welfare of our people via the laws they craft---to restructure society and the economy, to pull the poor Filipinos from the clutches of the poverty of centuries. Happily, Manny Pacquiao, your heart and your brains are gloriously in the ring. PLEASE STAY THERE. What the recent Supreme Court ruling that the RH Law is “not unconstitutional” succeeded in doing, among other things, is to spur more debates on various aspects of this issue, instead of slowing them down. For instance, one of the favorite arguments of pro-RH groups is that the mortality rate among women in childbirth is high, and statistics furnished by said groups vary from 11 women dying per day due to childbirth- related causes, to as many as 15 daily. This is said to be due to the lack of access to reproductive health services. I’ve been hearing the same argument since I began to be interested in the RH issue years back. The solution offered by pro-RH groups , however, to childbirth mortality seems to be to control the number of pregnancies with contraceptives. But in my simple mind, as well as to many others who have taken issue with that bill, wouldn't the better solution be to set up more hospitals and birthing clinics with basic equipment (such as ultrasound machines, so important), better-trained personnel and adequate pre-natal care, so as to reduce childbirth mortality? Women especially in the remotest rural areas often die of childbirth because sadly in this modern age, so many of them still give birth at home, often with only a comadrona attending. Hence, assuming that because of the RH Law, pregnancies would be controlled by various contraceptives and preventive devices, would this already guarantee that no woman would die of childbirth? Obviously not. Instead of pouring billions of pesos into contraceptives, many of which, as medical doctors against the RH law assert, are abortifacient (i.e., inducing abortion of a primary or secondary nature), perhaps the better option is to establish more clinics manned by adequately trained personnel. Just as worrisome as the childbirth deaths among women is the fact that many of these contraceptives imported from abroad induce cancer and other related diseases. The SC justices had a full hearing on this aspect, and apparently they believed the medical arguments when they struck out use of abortifacient contraceptives. Obviously too, the Filipino public believes what it hears about the harmful side of contraceptives. The popular radio-TV program “Umagang Kay Ganda” ran a survey the following morning after the SC ruling was promulgated , and the results showed an overwhelming number against the RH Law (where are the “surveys” supposedly supporting the law’s high acceptability coming from?). Another important point: if contraceptives manage to still elude the dragnet to be set up by anti-RH people in our courts, there would be an urgent need to beef up the cancer department at various hospitals. For as many doctors against the RH Law have argued, many contraceptives do induce this dreaded disease. This is really an event after my heart, so folks, if you're free, do go down to Aklan for this exciting summit and spread the word about it. Dubbed as the "Strategic Convergence of NGOs for Countryside Growth," this nationwide summit of NGOs is scheduled this April 21 at the Aklan State University in Banga, Aklan, with central theme of "New Vistas for NGOs." This summit will be under the auspices of the Ben-Hur Z. Mobo Move Aklan Forward Foundation, Inc. (BHZMMAFFI), which was organized in 1987 to enshrine the idealism and vision of Ben-Hur Zabal Mobo, who faithfully served Aklan and its people as a youth leader, pro-poor lawyer, senior Provincial Board Member, V-Governor and Governor. My good friend, former PNRC Gov. and veteran journalist Juan P. Dayang, who chairs BHZMMAFFI, says: "This coming Summit of NGOs aims to invite leaders and representatives of NGOs to converge and act together as an advocacy and mission-propelled movement---to help recast and re-invent vital sectors of Phil. society, so that they can set up a truly democratic and egalitarian polity." Invited to attend this Summit of NGOs are officers and members of foundations, organizations of professionals, different sectors of academe, humanitarian service groups, sectors engaged in volunteerism, reps of religious sectors promoting charitable and welfare services, and other civic groups. As we all know, PH is one of the most successful countries in the world for the harnessing of NGO power. Tara na sa Aklan on April 21. it's a short bus and boat-ride to glorious Boracay after the Summit.